Why Should I Subscribe to ChromeFans.org? Subscribing to Chrome Fans will allow you to automatically receive every new article whenever they get published. This provides a great deal of convenience for you, because you won't even have to visit this website to access all the latest articles or news. RSS Feed Subscriptions. New articles will be sent to a feed reader. What is RSS? What is a 'RSS Feed Reader' and How Can I Use it? RSS stands for Rich Site Summary or Really Simple Syndication. It adds functionality to a web site that lets users subscribe to content from that web site. RSS allows you to stay informed of your favorite web content without actually having to go to the web site. You can set up a page full of subscriptions from different places and keep tabs on all your content in one place. You can also stay informed without giving up any privacy. Come back to this page and click on this link to subscribe to Chrome Fans. And you're done! Remember to check your feed reader daily to see if new articles from Chroma Fans have been published. All the published articles from Chrome Fans will show up automatically in your feed reader. If you'll like to, start subscribing to other blogs or websites you fancy as well. Enter a legitimate email address. Enter the captcha (verification emssage) as it is displayed on the page. Once you see the screen below, visit your email inbox to verify your email address. If you don't receive any verification emails, please check your spam folder. You'll only receive one email every day regardless of the number of articles published. For example, if I publish 3 articles in a day, you'll get them all in one email newsletter. 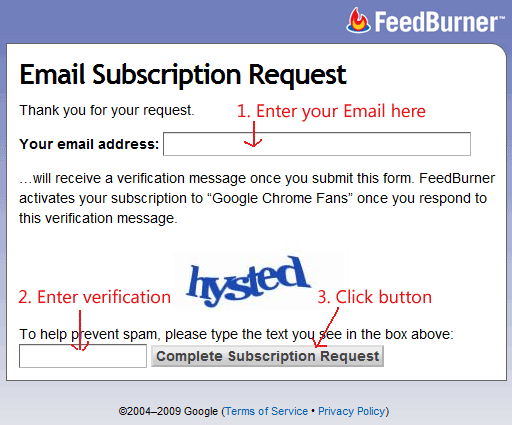 All email subscriptions are managed by Google Feedburner and you can unsubscribe anytime with a click of a mouse. 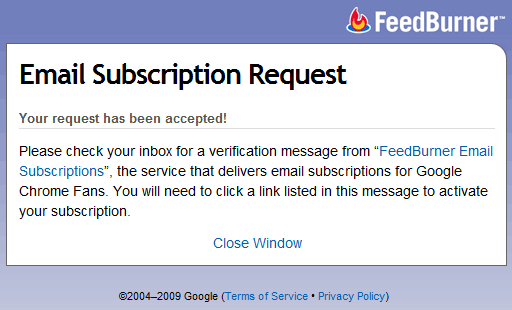 For your convenience, instructions for unsubscribing are included in each email newsletter as well. If you have any trouble subscribing to Chrome Fans, please contact me, I'll be happy to help in any way possible. for fletcher (#1 above): I only ask that question (is this a human) when I receive a greeting that is so inhuman that it really makes me want to know the answer to that question...now that we live in the days of 'Watson' I'm sure I won't be bothered by inhuman machine answers...and as C3PO might add: "thank The Maker"
I'm sure I won't be bothered by inhuman machine answers...and as C3PO might add: "thank The Maker"
i subscribe to remind and show that it is me replying to the content posting on my page. how the reality of the company telling to the people. i believed. they allowed them to post to the place that they can do what they said on the content. real company that succeeding did what they said. thank you.